If you admire the previous year's model, you are sure to be excited about the 2019 Acura RDX. This award-winning SUV has been revamped from bumper to bumper. Not only will you notice this vehicle's wider stance, you'll notice that the 2019 Acura RDX is longer and sportier. The well-appointed console features an integrated dynamic system that includes comfort, sport and sports plus drive modes. Each selection provides you with the power to change the feel of the steering and the throttle response. The 2019 Acura RDX features a 2.0L turbocharged 4-cylinder engine. 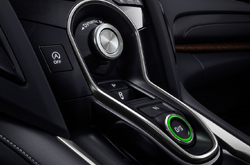 With a new rising center console, the interior of the 2019 Acura RDX has a luxurious and streamlined design. There are so many new features to admire about SUV. Visit Vandergriff Acura to take the all-new 2019 Acura RDX for a road test. What Colors and Features Are Available for 2019? This new SUV is available in several amazing exterior colors including Performance Pearl Red, Canyon Bronze, Gunmetal Metallic and Fathom Blue Pearl. 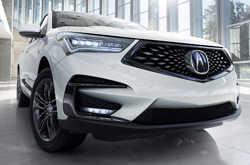 The 2019 Acura RDX features 4 available trim packages. Each trim package comes equipped with a panoramic moonroof with a tilt and slide feature, LED-illuminated dragon taillights and heated side mirrors. The Standard trim package features reverse gear tilt-down and chrome window molding. The Technology package includes dual exhaust outlets and front/rear parking sensors. The A-Spec package is equipped with exclusive dual exhaust outlets and black window molding. 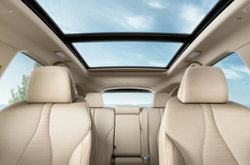 The Advance package features rain-sensing windshield wipers and acoustic front side glass. 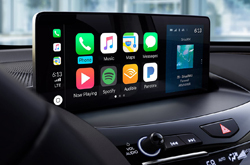 Technology features that are available in each package includes SiriusXM satellite radio, Bluetooth streaming audio and smartphone integration. Contact Vandergriff Acura to learn more about the distinct features of each trim package of the 2019 Acura RDX. The 2019 Acura RDX doesn't just have attractive interior and exterior features. Its engine and powertrain offers the responsiveness and acceleration that you'll need as you navigate around town. This SUV comes standard with 272 horsepower @ 6500 rpm. It features a 16-valve, DOHC VTEC engine. With a fuel tank capacity of 17.1 gallons, the 2019 Acura RDX requires premium 91 octane fuel for maximum performance. 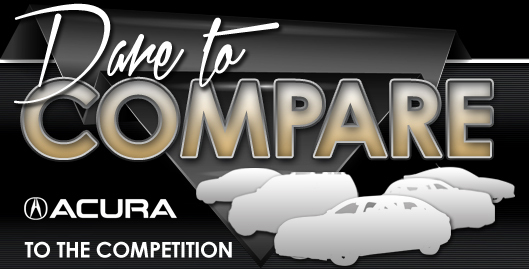 With Acura vehicles, safety and driver assistance features aren't an option - they are standard. Integrated safety features include a multi-view rear camera, a collision mitigation braking system and automatic high-beam headlights. This SUV also includes several front/side airbags, an anti-locking braking system and brake assist. Do you want to learn more about additional features that will keep you safe as you drive the 2019 Acura RDX? Visit or contact Vandergriff Acura for additional details or to get behind the wheel of this vehicle.